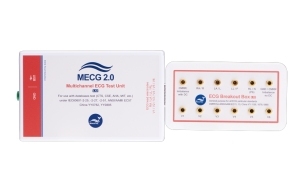 The ECG database player designed for system validation and software algorithms evaluation. Compliant with IEC 60601-2-25, IEC 60601-2-47, ANSI/AAMI EC57, YY0782 and YY0885. 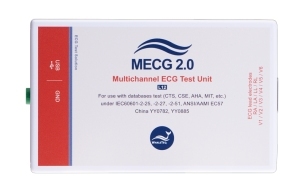 ECG database generator for diagnostic and ambulatory ECG. 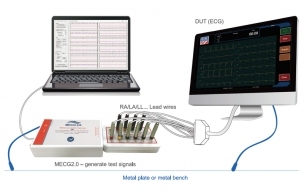 Generate waveforms simultaneously up to 8 channels and support 12 lead ECG. Embedded CAL, ANE, NST and biological waveforms. Directly support AHA, MIT, CU and PhysioNet format databases. Extreme accuracy of output voltage accuracy < ± 8uV. Support raw-data playback function for user to play recorded waveforms from clinical trials. must have a lower limit). value a 5µV is suitable for this requirement. Time accuracy IEC 60601-2-51 does not provide any limits. An inferred limit from the device under test. An inferred limit of ±1% is used (see 4.2). Environment Intended for normal laboratory environment.